Edge Dental has been restoring luster to teeth and confidence to smiles for over 15 years. In that time, we’ve had patients come to us with the full spectrum of cosmetic dental issues. From whitening to implants, veneers to bridges, every one of our patients has left our office smiling unabashedly. Veneers are thin shell-like restorations that are designed to cover the front portion of visibly damaged teeth. They are meant to restore teeth that have experienced only minor damage, such as small chips or cracks, gaps between the teeth, misshapen teeth, discoloration, or slightly overlapping that does not impact your bite or the health of your mouth. Veneers can be made from composite resin or ceramic, although ceramic is often the preferred material. Ceramic mimics the properties of your natural enamel. Not only can it be perfectly matched to the color of the rest of your natural teeth, but it also mimics the light reflection properties of enamel, giving them a completely natural appearance. Dental Bridge are fixed appliances that will work to restore the structure and function of your teeth after tooth loss. These appliances are non-removable, so they will become a permanent part of your smile. Cavities are small pits that form on your teeth as a result of tooth decay. Untreated, they grow worse, weakening the structure of the tooth and increasing your risk of developing an infection. Fillings are designed to restore a tooth affected by a cavity. Once the decay has been removed, the filling prevents new bacteria from taking up residence and causing further damage. Tooth-colored fillings, which are made from a composite resin material, provide an aesthetic alternative to traditional amalgam fillings. These fillings are popular for filling cavities in visible teeth. They are also free of metal and mercury, both attributes that make these fillings preferable to amalgam. Bonding is a procedure done to restore minor damage to your teeth, including small chips and cracks, gaps between teeth, and misshapen teeth. The material used for bonding is a composite resin, which is made of fine glass, plastic, and other materials. Bonding is a simple, painless procedure that can be completed in less than an hour. It also does not require any removal of tooth enamel. Instead, an acid etch is used to create a rough surface on the teeth, which helps to enhance the bond between the material and your natural tooth. Composite resin is easily shaped and molded to fit your specific needs, and provides you with a seamless restoration of your smile. Your tooth enamel is naturally a brilliant shade of white. However, there are many factors that can dull the brilliance of your teeth. Darkly pigmented foods and drinks, smoking, certain medications, even age can all impact the color of your teeth. Discolored teeth can give the impression that you don’t take care of your mouth, or that you are older than you are. Teeth whitening is a process that restores the brilliant white color to your smile. There are two ways in which teeth can be professionally whitened. Chairside whitening, performed in our office, is done in approximately one hour. A whitening agent is painted on your teeth, and your teeth are then exposed to a special light. Following your treatment, your teeth are noticeably several shades whiter. You can also whiten your teeth at home on your own time with take-home trays. These trays are created from impressions of your mouth. We also provide you with the whitening agent and specific instructions for use. Results are usually noticeable in about one week. 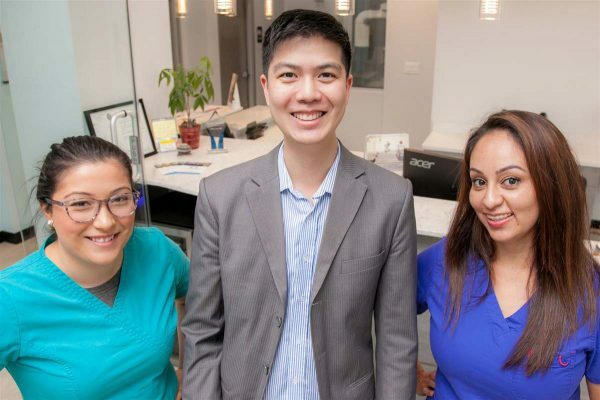 The Six Month Smiles® orthodontic treatment is specifically designed for adults and teenagers over 15 years of age, who have crowded, crooked or spaced teeth, but without major bite issues.